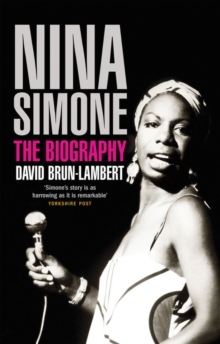 "The greatest female artist of the 20th century" - Elton John This first-ever biography of Nina Simone caused quite a stir among reviewers. "A chastening read", said the Sunday Times; "Simone's story is as harrowing as it is remarkable", said the Yorkshire Post. No-one was quite prepared for the life story of the singer of such enduringly uplifting classics as "My Baby Just Cares for Me" turning out to be such a chilling litany of mental disorder, vile temper, terrible abuse at the hands of bad men, and a self-destructively hostile attitude all too often to the acolytes who came to see her perform. Brun-Lambert shows how Simone saw herself as a lifelong victim of racism, right from being turned down by the prestigious music school that would have enabled her to become a classical musician. Undiagnosed bipolar disorder, he argues, added to her torment. But it was her unforgettable voice, and, at best, her utterly magnetic performances, that kept people coming to a sold-out Ronnie Scott's every time she was in residency, and the way she sang her hardest songs like "Mississippi Goddam"with such fire and fury that they became anthems of political change, and means so many people can only be curious about the real life of the mecurial woman behind the piano. David Brun-Lambert is a highly regarded French writer and broadcaster.